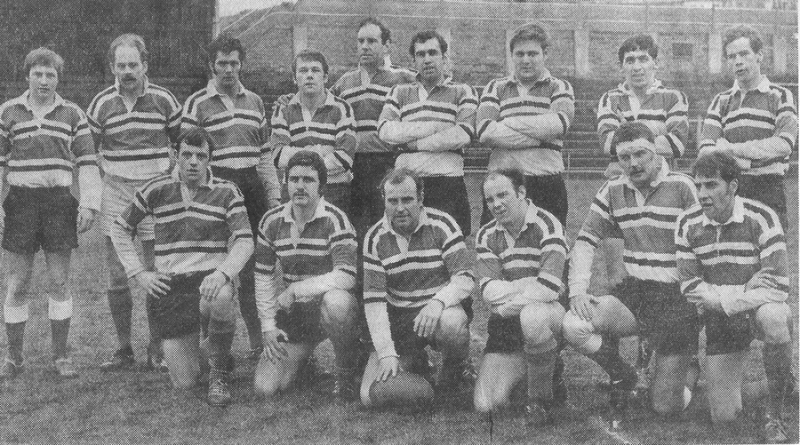 The Plymouth Argaum XV which reached the Devon Cup Quarter Final: Kieron Dwyer, Ken daniels, Craig Muir, Roger Ninnis, Barry Rees, Frank Lavis, Dave King, John Price, Roger Curtis; Chris Cooms, Phil Sargent, Ray Plummer(capt), John Clarke, Jeff Perring, Fred Gill. Away to Falmouth, the side went under by the narrow margin of 8-11 (John Price try, conversion Paul Beed, Dave King penalty goal). However, the following week South Molton were comfortably disposed of in the Devon Cup to the tune of 28-5. Exeter University inflicted a sharp defeat 3-20, after which, success was resumed, Kingsbridge 27-17, Okehampton 25-3, Tiverton 24-8, Exeter Saracens 22-11 and Camborne School of Mines 16-3. There followed defeats 3-16 Services A and Hayle 3-14, but the next week the Club disposed of Brixham in the Devon Cup at Bickleigh Down by 21-12 after being 3-9 down - the scorers Daniels penalty goal plus 3 conversions tries M Williams, T Williams and Perring. The successful team P Marshall, M Williams, K Daniels, R Curtis, C Muir, P Beed, R Plummer, D King, J Clarke, T Williams, F Lavis, R Jones, F Rogers, R Bowden and G Perring. This win resulted in an away fixture in the next round of the Devon Cup against Devonport Services, who were to become the Club’s chief bugbear in this competition and this, the first meeting was no exception. Losing Craig Muir through injury early in the 2nd half, the Club exited from the competition 0-9. In other results the Club completed the double over Kingsbridge, Newquay and Launceston but Hayle reversed the trend 3-14 and 3-8, whilst Brixham convincingly reversed their cup defeat, this time at Brixham 0-15. 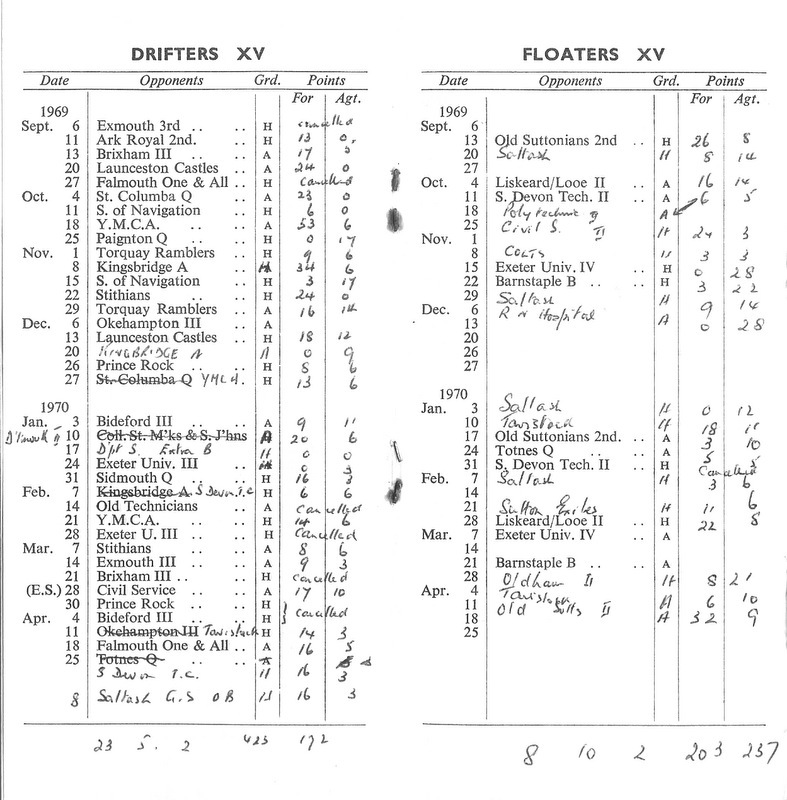 A nip and tuck battle at Bideford - arranged at short notice - resulted in a 16-18 defeat due eventually to a try by Bideford’s Turner which, according to the local press, "resulted from a remarkable decision by the referee (Bill Pain) which was hotly and justifiably disputed by the Argaum players". Easter visitors Oldham 6-6 and Newport Saracens 3-11: The team results for the season W26, L10, D2, 607-270. 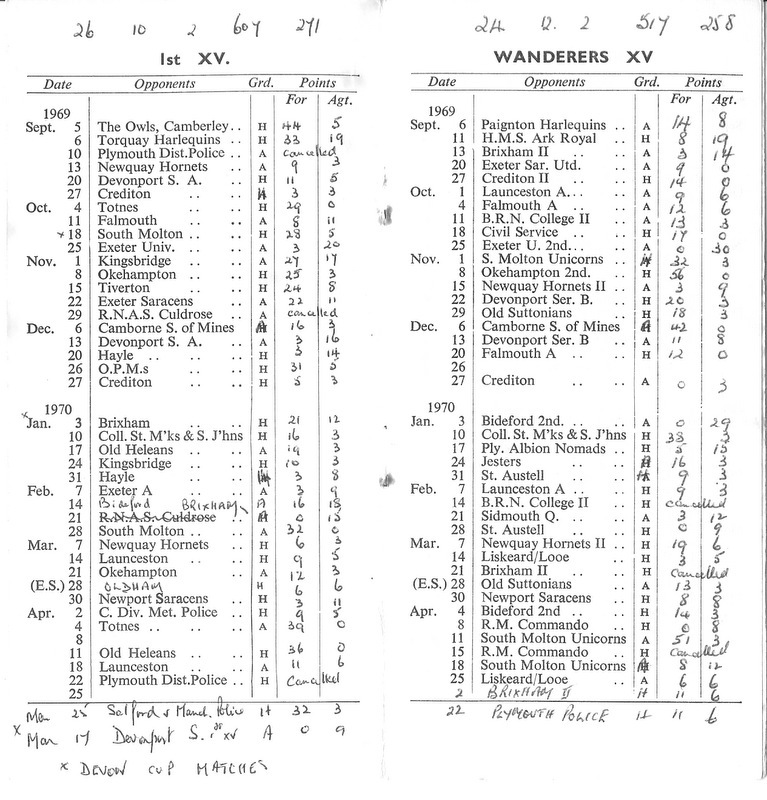 Tom Doughty captained the Wanderers who W24, L12, D2, 517-258, whilst the Drifters with "veteran" John Ellis in charge, turned in most respectable figures W23, L5, D2 and the Floaters W8, L10, D2. The Colts struggled throughout a season in which their playing strength was rarely sufficient to raise a full side and on this account suffered several heavy defeats to end W9, L15, D1, 280-339. The sudden break in the success of the Colts was due to six of the best players being persuaded to defect to Albion. 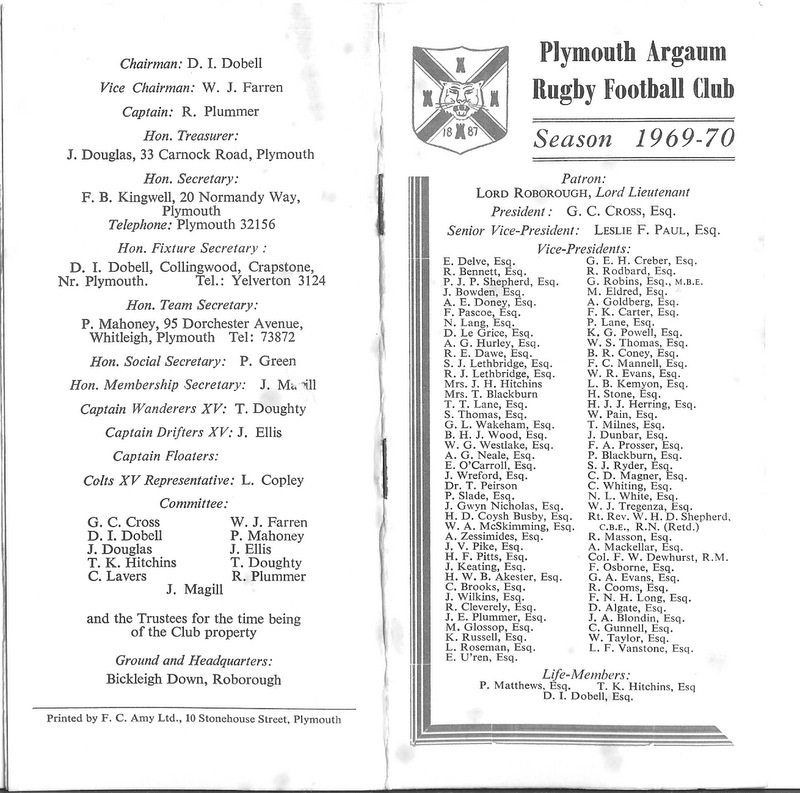 Another former Argaum player, George Creber (a pre-war "flying" wing three quarter) had become Lord Mayor of the City of Plymouth and was therefore conveniently on hand to perform the opening ceremony for an additional - and very necessary - bar at the Clubhouse, appropriately named "Tom’s bar".